The above infrared image (1.6 microns) is a superposition of 5 detections of the new moon (taken --clockwise from top-- on the nights of Nov 1998, 6, 7, 9, 10, and 1 UT). The blue dashed line shows the orbit of the moon around the primary asteroid (45) Eugenia. The period of the orbit is 4.7 days. The moon travels in a clockwise direction (with North up and East to the left). The radius of the orbit is 1190 km. The main asteroid's diameter is close to 215 km (depicted here as a central white circle) and we estimate the moon's size is 13 km in diameter. 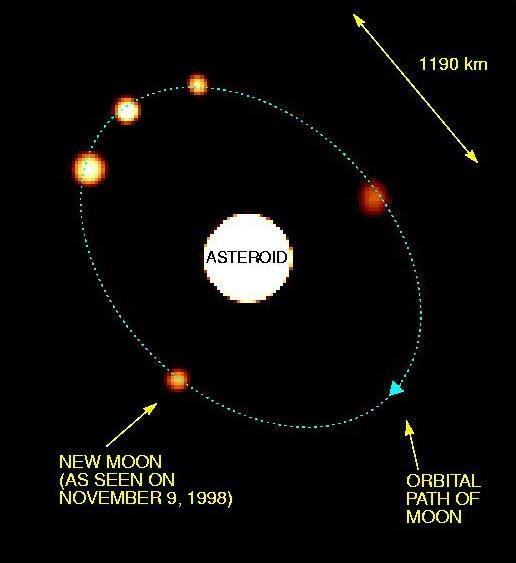 The moon is 285 times fainter than the main asteroid and is very close to the main asteroid (just over 5 asteroid diameters away, or 0.77 arcseconds on the sky). 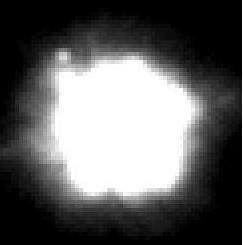 Image processing (deconvolution) was used to increase the contrast between the moon and the main asteroid. The apparent variations in the moon's brightness and size are artificially produced due to changes in the atmospheric clarity from night to night. 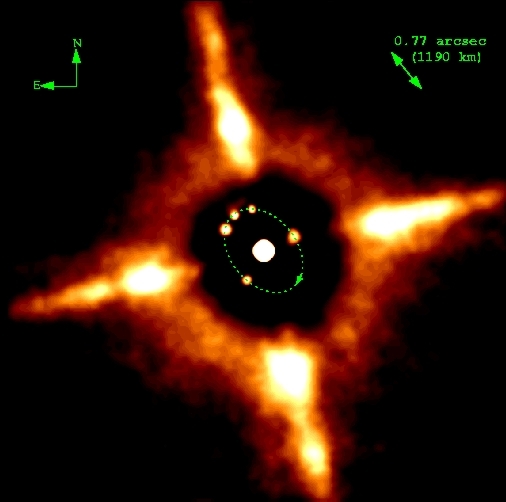 Utilizing adaptive optics this image (resolution of approximately 185 km or 0.12 arcseconds on the sky) is 6 times sharper than could have been otherwise obtained from the ground. Images taken with the PUEO adaptive optics system of the Canada-France-Hawaii Telescope located on Mauna Kea, Hawaii. Above is the unprocessed, "raw" image from which the discovery was made on Nov 1, 1998. This shows the primary asteroid, with the satellite (white blob to upper left at about 10:30 position).